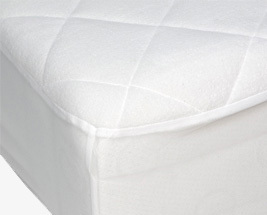 We have a great range of Quilted Mattress Protectors to suit all bed sizes and budgets. All of our quilted protectors are breathable, 100% waterproof and incredibly comfortable, with a soft wadding core for a great nights sleep. The quilted nature of the protector gives a lower pressure risk than a standard flat sheet, available in: 100% cotton, woven cotton and super soft microfibre, offering truely luxurious bedding at great prices.